Several recent posts have profiled heavily embellished and patterned trucks. This seems like a good time to introduce a design exercise centered on patterning. 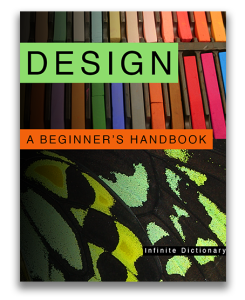 If you have a copy of our book “Design: A Beginner’s Handbook” I suggest you refer to chapters 7 (Color), 9 (Balance), 13 (Pattern) and 14 (Rhythm). These exercises can be completed using paper and paint or colored pencils, or you can work digitally using a program like Adobe Photoshop or Adobe Illustrator. Remember, pattern is created through repetition. These are all quick exercises so do several examples of each. 1 • Create a pattern using only stripes. The simplest version of this would be alternating bands of black and white. See what can happen by varying the widths of the bands and by using more than two colors. Try changing line direction – vertical, horizontal and/or diagonal. Also, bands can move from one edge of the paper to the other or they can span only a partial distance, being interrupted by a band moving in another direction. 2 • You’ll use a single shape to make a concentric design. Use progressively smaller versions of that shape, one placed within another. A bulls-eye is an example of a pattern made this way. I suggest doing several examples with different types of shapes – geometric (circles, squares, triangles etc.) and biomorphic (irregular). Once again, you can vary the distance between each shape, creating different sized bands. Play with the number of colors you use. Consider a complementary color scheme and maybe one that uses analogous colors. 3 • Next you’ll make another type of radial design. Take a small square piece of paper and fold it diagonally. Repeat until you have divided the paper into 8 equally sized slices. Make a drawing/pattern in one of the slices. Copy it to the other 7 slices, flipping it every other slice. The square you’ve just made is now a repeatable unit called a motif. 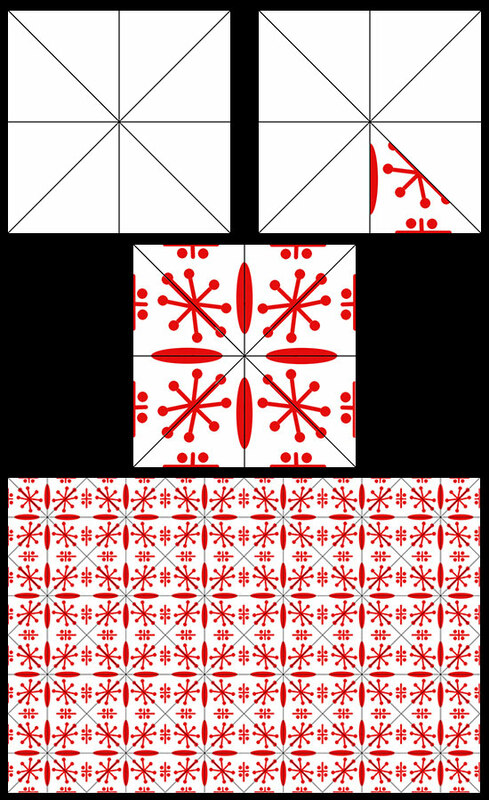 Make multiple copies of this design and then align them edge to edge to make a paper quilt. 4 • Use a grid to make a repeatable motif. You can draw your own grid or use graph paper. Start with a single color and fill in squares to make a pattern. Now use multiple copies of this motif in a variety of colors to form a patterned design. 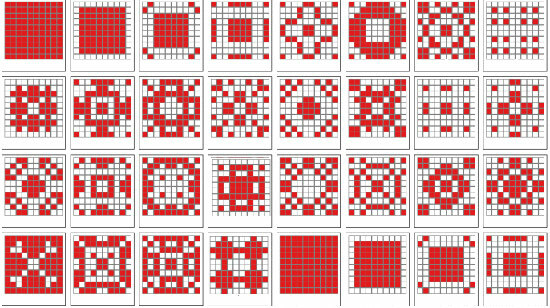 Here is a link to a website that analyzes some Islamic designs that are based on a grid. Save these exercises. Next week we’ll use them in an extension of this exercise. We’d love to see what you’ve done. Post your results on our Facebook page. This entry was posted in Elements and Principles, How-To, Resources and tagged art education, art lesson, design education, design exercise, design lesson, grid, pattern, pattern exercise, radial pattern. Bookmark the permalink.